I created this video in May 2016 for Emmy consideration. The strict submission rules demand a concise, direct delivery, free of music, and motion graphics bombast. For season seven of Archer, I devised and directed the sequel to the Emmy Award winning Alternate Reality Game Archer Scavenger Hunt 2015, creating another enormous trail of spy themed challenges in a multi-episode, multi-platform experience with the goal of interacting with and rewarding our fans. In a repeat of 2015, we were again honoured by the Television Academy with an Emmy Award for Outstanding Creative Achievement in Interactive Media – our second Emmy Award in two years! 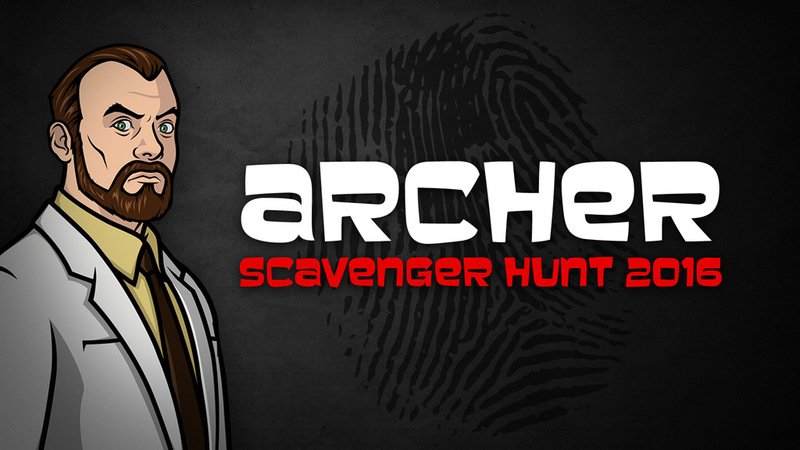 Who will be the genius that solves the Archer season seven scavenger hunt? … It would take the most focused and devoted sleuths to put this massive puzzle together. 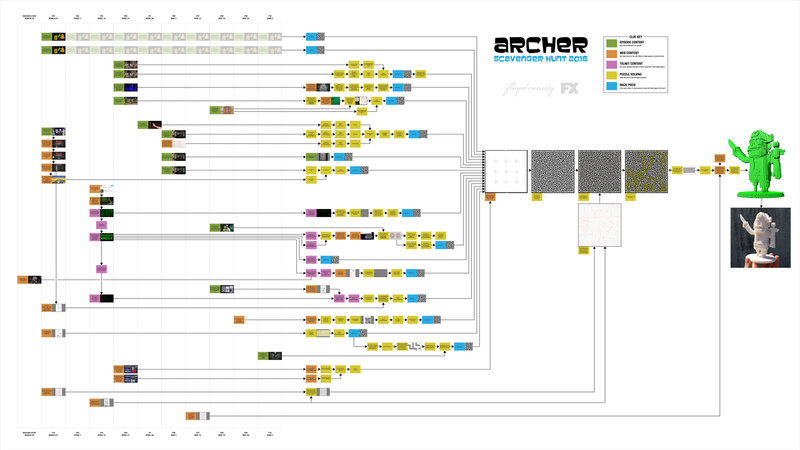 While Archer Scavenger Hunt 2015 was a single thread of 68 steps, the 2016 sequel more than doubled it with 18 individual threads and 145 steps converging on a single point, making it the most elaborate alternate reality game in television history. The ARG ran the entire length of the season, and every episode featured a clue or brand new puzzle to drive the game forward – not a single puzzle was repeated from the previous season! Fans completed it a few weeks after the season finale. The Archer Scavenger Hunt 2016 flowchart. Get a full resolution PDF here. If you printed the infographic on standard 8.5" x 11" paper and taped it end to end, it would be 60ft long or five stories high! If you print to fit the width of a standard 48ft billboard, its height would soar 3/4 mile into the sky and dwarf the world's tallest buildings! But seriously, don't do that. Archer Scavenger Hunt is a great example of what you can achieve when you really know your audience, and after the success of our previous ARG the fans were expecting us to make another. There was no longer the element of surprise. We decided to use that to our advantage, turning everything on it's head and confounding the fans expectations. Once again, the ARG appeared to have been created by the show's resident mad scientist Dr Krieger, but something sinister was afoot: his computers, files, and real life social media accounts had been compromised. The true mastermind was season two favorite, The Pirate Virus. It caught the fans completely off guard. 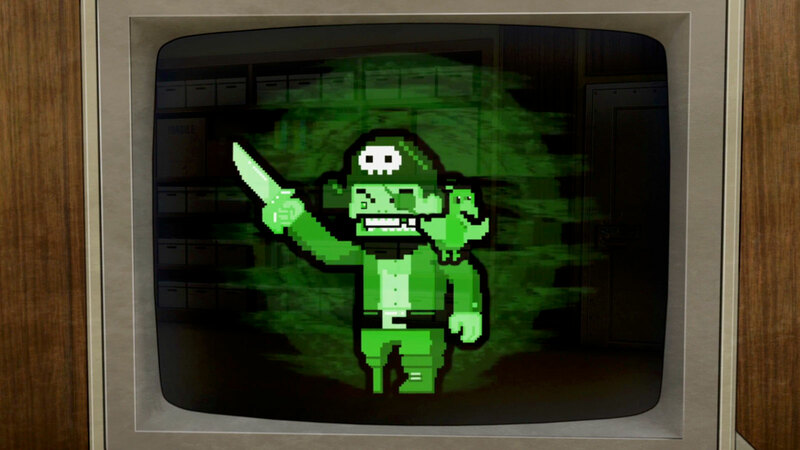 The Pirate Virus, as seen in the Season 2 episode Tragical History. This narrative I devised was a reaction to the success of the original scavenger hunt: the mischievous computer virus had become self-aware, hijacking Krieger's devices and creating an ARG of it's own to harness the immense power of the fans, tricking them into thinking it was Krieger they were helping again. The virus was using this super-sleuthing brain trust to assemble an advanced holographic projector to escape into the real world. Fans self organized, creating chat rooms and collaborative documents to solve the hunt together. After engaging the fans with a wide variety of off-channel content and interacting with them in exciting, unexpected ways, the ultimate prize was a 3D printable model of the Pirate Virus. Fans could finally own a tangible prize for their efforts, echoing the conclusion to the game by bringing a beloved character into their own world. Massive kudos to the unnamed person or persons who followed it through to the end. … it's insanely elaborate … absolutely mind-boggling. 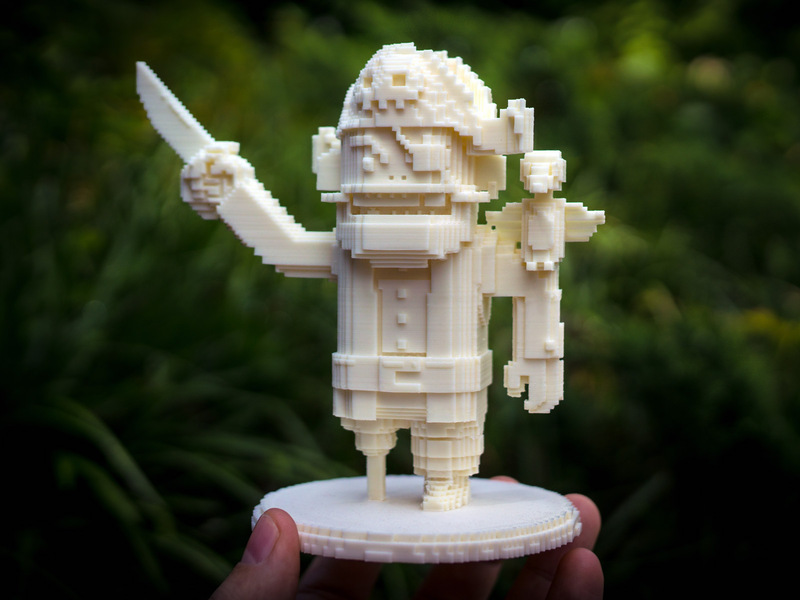 A 3D print of The Pirate Virus, the ultimate prize of the Archer Scavenger Hunt 2016. The only thing more mind-blowing than the fact that somebody actually solved it, was the fact that somebody actually created it. And it worked. I don't even know where to start – the backlog of "attaboys" and back-pats and high-fives and thumbs-ups and dropped-jaws and hats-offs and "goddammit, sirs" now seems insurmountable. I was responsible for directing and planning the entire thing, and creating and deploying around 90% of the content. 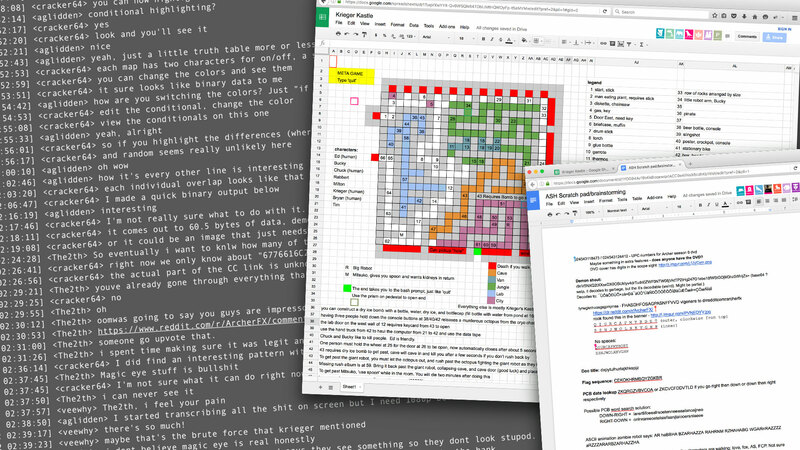 From devising devious puzzles to making a six minute ASCII animation, from coding secret websites from scratch to writing dialogue – I flexed just about every creative muscle in my toolbox and discovered a few new ones along the way. Putting it all together was a challenging, exhaustive and ultimately rewarding process. I would often bounce ideas off Tim and he contributed to several great puzzles, but his main contribution was the fantastic and purposely boring video game Milton: Toast To Toast, where your mission is to drive the show's toast-making photocopier to Los Angeles at a break-neck 3mph, which takes around three hours of real time. Occasionally you'll see a billboard – and don't ignore them because you can't reverse course – they spell out a code in maritime signal flags. This code was combined with another code from an episode to reveal an important clue. 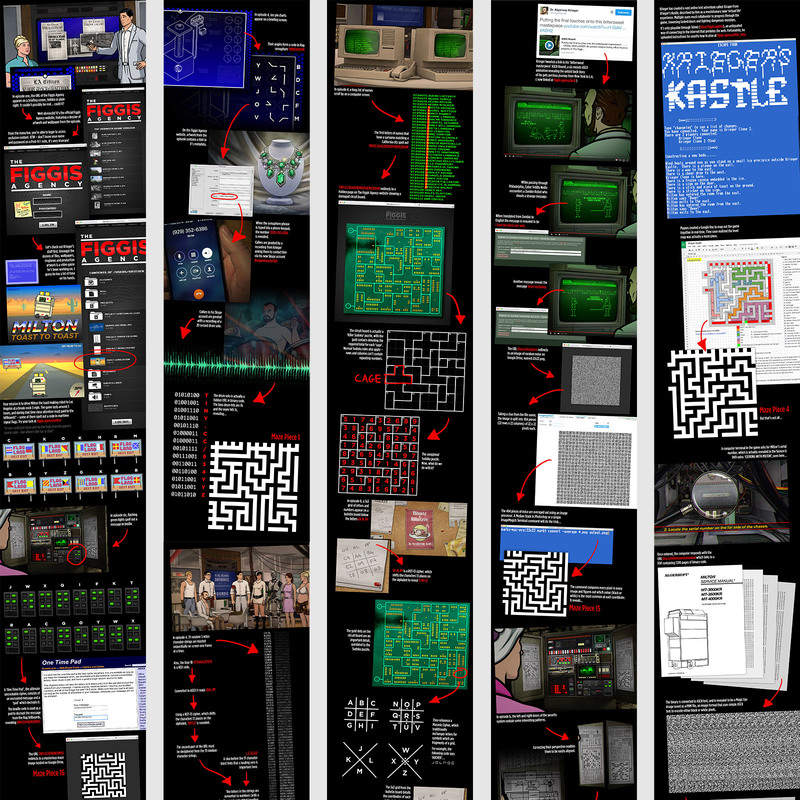 Bryan created a hidden and incredibly difficult online multiplayer text adventure 'Escape From Krieger's Kastle', described by Krieger as a revolutionary new ‘virtual life’ experience. Completing the adventure revealed an important clue and was therefor a required step for completing the ARG. It’s only playable through Telnet, and was revealed 'accidentally' if you hit a key during ASCII Bound, the six minute Telnet ASCII animation I created. Telnet is an antiquated way of connecting to the internet that pre-dates the web. Fortunately, Krieger uploaded instructions for exactly how to play the text adventure at figgis.agency/efkk_beta. I designed the instructions to appear as if Krieger was illegally fax blasting the phone book at the companies expense, much to the annoyance of Cyril Figgis, the show's resident comptroller. 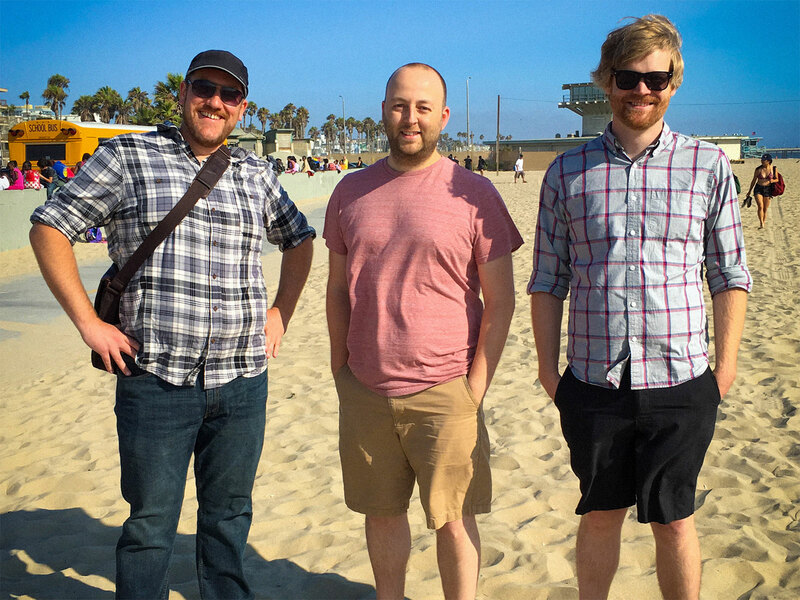 (L to R) Tim Farrell, Mark Paterson and Bryan Fordney, creators of Archer Scavenger Hunt 2016, relaxing on Venice Beach after presenting to a Television Academy jury for Emmy consideration.